For the first time in years, the Macintosh has got me excited again. Apple’s latest iterations of the long running iMac may motivate me to finally buy a new computer sometime this year or next. The iMac has been sitting fairly dormant since its last update in late 2015. Gotta love the specs of the new 2017 iMacs introduced at the Worldwide Developers Conference (WWDC) on June 5. There are three distinct models: 21 inch iMac with standard LED backlit display; 21 inch iMac with 4K Retina display and the 27 inch iMac with 5K Retina display. Prices for the low end model start at $1099, $1299 for the 4K model and $1799 for the 5k 27 inch model. Custom configurations will certainly boost the price. What I like about the iMacs is that they have a lot of ports for connecting a number of devices. This include standard 1/8 inch analog headphone jack, 4 USB 3 ports, 2 USB C “Thunderbolt 3” ports, gigabit ethernet port and SDXC card slot. Nice. The new iMacs now come with Intel’s 7th generation “Kaby Lake” processors which can run at speeds up to 4.5 ghz. They also get a “fusion drive” as standard equipment. SSD drives remain an option. The iMacs also have built-in wifi and bluetooth. All of the new iMacs are available for sale now at the Apple Store and online site. That all said, it is likely that when I buy a new Mac it probably will be an iMac. I have long been yearning for a desktop Mac after spending many years on my aging MacBook Pros and Chromebook. My ideal iMac will have an internal SSD drive, the maximum amount of RAM possible, retina display and perhaps a second display using one of those thunderbolt ports. I already have wired ethernet so that will be a nice hookup for the iMac. Announced at the WWDC was a new high end iMac called the iMac Pro. 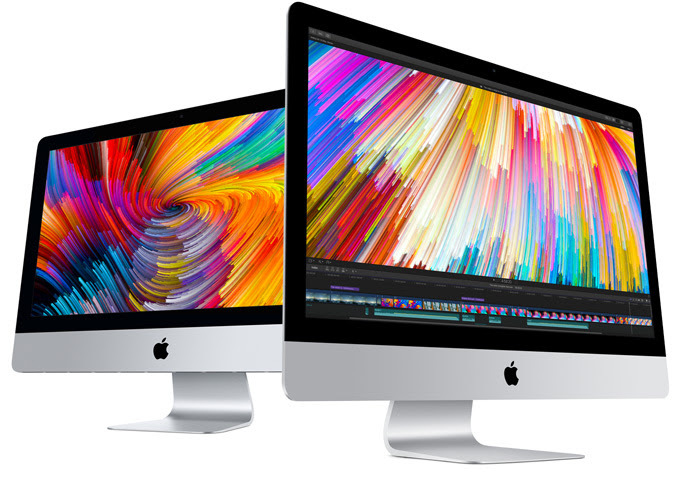 Starting at $4999 retail, this new iMac is aimed at high end workstation, business, scientific and creative users. The new iMac Pro will be available in December 2017. It will be Apple’s flagship Mac for at least a year until a new Mac Pro desktop model is announced sometime in 2018. WWDC also saw the announcement of refreshed MacBook Pro and MacBook laptops, new iPad Pros, new wireless keyboards, operating systems (Mac OS “High Sierra”; iOS 11, Watch OS4), and the Siri based HomePod speaker system. The June 2017 conference was hailed as one of the best in recent months given all of the hardware and software updates announced. Photo: Apple’s new iMacs courtesy of Apple, Inc. This entry was posted in Apple, Commentary, iMac, iOS, iPad, Mac OSX, MacBook Pro and tagged announcements, Apple, commentary, High Sierra, iMac, iOS, iPad, Mac, MacBook, MacBook Pro, Macintosh, MacOS, News, OSX. Bookmark the permalink.